As said in the post about Fedora 20 and the Dell M3800, I would come back to elaborate on using a HiDPI screen with certain applications. As said in that post, things have improved generally since I have switched to Gnome 3.12. So, all the default applications scale well, and do their work correctly. Now, just to set the perspective: the resolution on my laptop is 3200×1800 on a 15 inch screen. Most laptop displays currently available run 1366×768 on 15 inch (which is really bad) or 1920×1080. So, in essence, whenever I do a remote desktop from my laptop to my pc at home, which runs at 1600×1050, well, you can probably guess what happens: the Remote Desktop takes up about a quarter of my display, with all text scaled to this proportion. This can be solved by using programs such as Remmina, which is capable of doing scaling. However, there are also programs which are not able, yet (I hope), to scale properly on a HiDPI screen… And the programs I am referring to are not obscure programs that hardly anyone uses… The most annoying one is Chrome, Google Chrome. Why it cannot handle a HiDPI screen I cannot, for the life of me, understand. If you look at the screenshot, which will be scaled to your display, probably, you can see the difference between Firefox (upper-left) and Chrome (lower-left). See the difference between the tabs and the address bar? Also, have a look at Spotify (lower-right), Steam (Middle-right), and DropBox (upper-right). 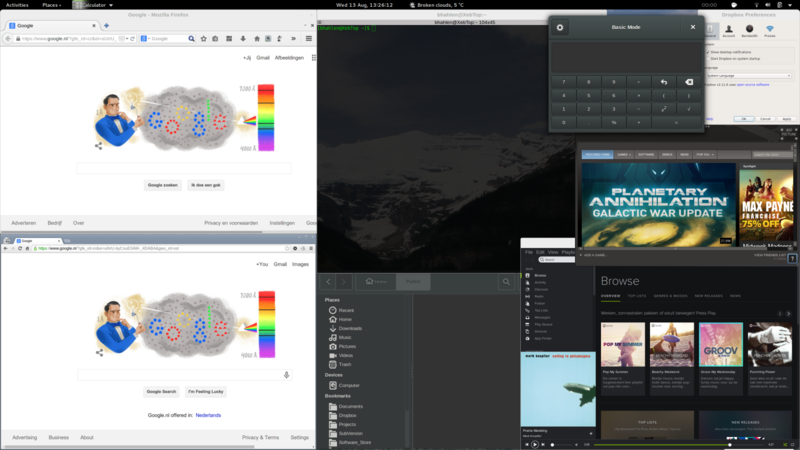 Compare those to the Calculator (to the left of DropBox), the Terminal (upper-middle) and the file-browser (lower-middle).